NBC 6 has team coverage as the biggest storm to hit the area comes closer to the state as officials continue to warn residents to prepare for the worst. 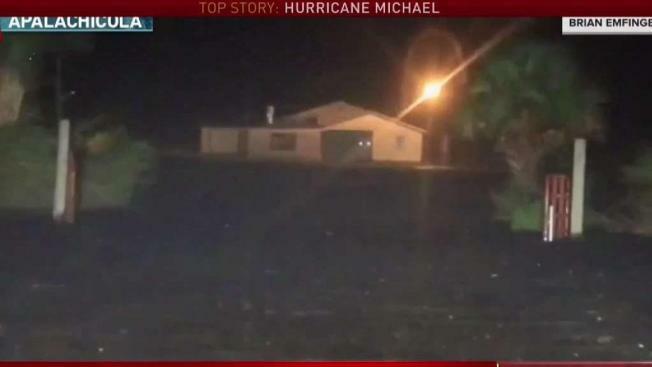 UPDATE: Hurricane Michael made landfall near Mexico Beach with maximum sustained winds of 155 mph. Read more here. Michael's leading edge careened onto northwest Florida's white-sand beaches as a still-growing Category 4 hurricane Wednesday, lashing the coast with tropical storm-force winds and rain and pushing a storm surge that could cause catastrophic damage well inland once it makes landfall. The unexpected brute quickly sprang from a weekend tropical depression and grew to top winds of 150 mph, the most powerful hurricane in recorded history for this stretch of the Florida coast. The sheriff in Panama City's Bay County issued a shelter-in-place order before dawn Wednesday, and Florida Gov. Rick Scott tweeted that for people in the hurricane's path, "the time to evacuate has come and gone ... SEEK REFUGE IMMEDIATELY." At 1 p.m., Michael was about 20 miles south of Panama City and 15 miles from Mexico Beach, but moving relatively fast at 14 mph. Tropical storm-force winds, extending 185 miles from the center, were already lashing the coast, and hurricane-force winds reached out 45 miles from the center. "This is the worst storm that the FL Panhandle has seen in over a century," Scott tweeted Wednesday morning. The storm now appears so powerful — with a central pressure dropping to 933 millibars — that it is expected to remain a hurricane as it moves over central Georgia early Thursday, and unleash damaging winds all the way into the Carolinas. Rainfall could reach up to a foot (30 centimeters), and the life-threatening storm surge could swell to 14 feet (4 meters). "We are in new territory," National Hurricane Center Meteorologist Dennis Feltgen wrote in a Facebook post Wednesday. "The historical record, going back to 1851, finds no Category 4 hurricane ever hitting the Florida panhandle." Florida officials said more than 375,000 people up and down the Gulf Coast had been urged or ordered to evacuate. Only a skeleton staff remained at Tyndall Air Force Base, which is located on a peninsula just south of Panama City. The home to the 325th Fighter Wing and some 600 military families appeared squarely targeted for the worst of the storm's fury, and leaders declared "HURCON 1" status, ordering all but essential personnel to evacuate. The base's aircraft, which include F-22 Raptors, were flown hundreds of miles away as a precaution, a spokesman said in a statement. Evacuations spanned 22 counties from the Florida Panhandle into north central Florida. But civilians don't have to follow orders, and authorities feared many failed to heed their calls to get out of the way as the hard-charging storm intensified over 84-degree Gulf of Mexico water. "I guess it's the worst-case scenario. I don't think anyone would have experienced this in the Panhandle," meteorologist Ryan Maue of weathermodels.com told The Associated Press. "This is going to have structure-damaging winds along the coast and hurricane force winds inland." Maue and other meteorologists watched in real time as a new government satellite showed the hurricane's eye tightening, surrounded by lightning that lit it up "like a Christmas tree." University of Georgia's Marshall Shepherd, a former president of the American Meteorological Society, called it a "life-altering event," writing on Facebook that he watched the storm's growth on satellite images with a growing pit in his stomach. "We have done everything we can as far as getting the word out," Smith said. "Hopefully more people will leave." Most of the waterfront homes stood vacant in Keaton Beach, which could get some of the highest water — seas up 9 feet (2.75 meters) above ground level. "I know it's going to cover everything around here," said Robert Sadousky, who at 77 has stayed through more than four decades of storms. 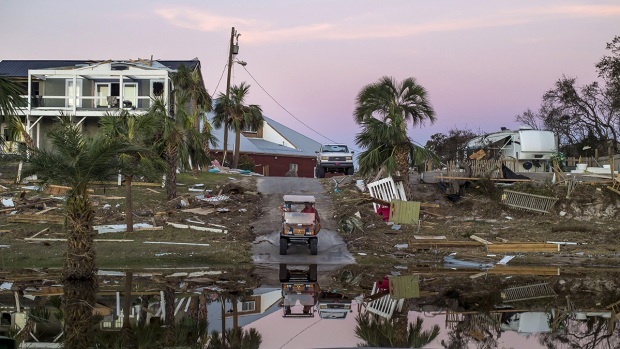 The local geography — low-lying land and lots of areas where people live along waterways — means many people living inland could see their homes flooded as Michael makes landfall. "We don't know if it's going to wipe out our house or not," Jason McDonald, of Panama City, said as he and his wife drove north to safety into Alabama with their two children, ages 5 and 7. "We want to get them out of the way." Scott had warned of a "monstrous hurricane," and his Democratic opponent for the Senate, Sen. Bill Nelson, described a destructive "wall of water," but some officials didn't see any rush of evacuees ahead of the storm. "I am not seeing the level of traffic on the roadways that I would expect when we've called for the evacuation of 75 percent of this county," Bay County Sheriff Tommy Ford said Tuesday. In the dangerously exposed coastal town of Apalachicola, population 2,500, Sally Crown planned to hunker down with her two dogs. "We've been through this before," she said. "This might be really bad and serious. But in my experience, it's always blown way out of proportion." Mandatory evacuation orders went into effect in Panama City Beach and other low-lying areas in the storm's path. That included Pensacola Beach but not in Pensacola itself, a city of about 54,000. Michael will weaken over land but could still spin off tornadoes and dump rain along a northeasterly path over Alabama, Georgia, the Carolinas and Virginia before its remnants head out to sea again. Forecasters said it also could bring 3 to 6 inches of rain, enough to trigger flash flooding in places still recovering from Hurricane Florence.